KGH Electrical is an elite specialist covering all aspects of electrical services. As part of a wide range of fantastic services we can do re wiring, lighting, fixtures, fittings, house electrics, electrical repairs and electrical installations. 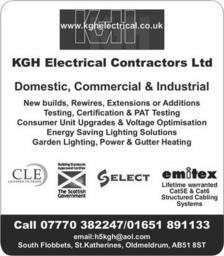 Based in St Kathrines the services of KGH Electrical are available to both domestic and commercial customers. We are willing to travel long distances from our base which means we can cover other areas throughout Aberdeenshire.